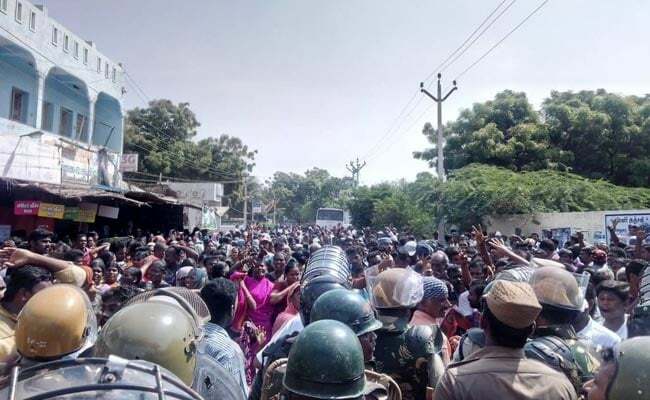 Protesters have demanded closure of the Sterlite copper smelting plant in Tuticorin. The construction of a second copper smelting plant by Sterlite in Tamil Nadu's Tuticorin was put on hold by the Madras High Court today - less than 24 hours after 10 people died in police firing on protesters in the port town. Sterlite has been planning to build a second plant with aims to double production capacity. The protesters had been demanding a permanent closure of the existing plant, blaming it for extensive pollution in the area. The petition claimed that Sterlite, the copper arm of mining giant Vedanta, is fraudulently building the second copper plant at a different site with no approval. The freeze on the construction will be on till September 23, the court said. The company was ordered to get environmental clearances by then. Construction can start only after a public hearing and environmental clearances, the court said. The existing plant of Sterlite is at the centre of a huge controversy, with locals in Tuticorin alleging that it is responsible for long standing pollution, resulting in health problems. In March 2013, hundreds have suffered breathing difficulty, nausea and throat infection following an alleged incident of gas leak. The plant has been in steeped in controversy for alleged violation of green norms. Earlier, a shutdown was ordered but the National Green Tribunal ultimately allowed it to be reopened. In another case, the Supreme Court had slapped a Rs 100-crore fine on the plant for pollution over the years. Sterlite had claimed it adheres to pollution control norms. This time, It has been shut since March 27, when it closed for routine maintenance. Soon after, the Tamil Nadu Pollution Control Board refused to grant it licence to reopen, accusing it of violating pollution-control norms. Sterlite has challenged it in court. Activists have been up in arms at the prospect of a second Sterlite plant in the area and have been on protest for more than three months. Yesterday's violence took place during a march to the district collector's office, meant to mark the conclusion of 100 days of protest.